As a child growing up outside Tulsa, Oklahoma, artist Bryan Parker was constantly drawing. After high school, craving direction, Bryan enlisted in the Army. He spent 14 months deployed in Iraq, but he never forgot his love of art and self-expression. While still serving in a combat zone, Bryan bought a video camera and began documenting his experience on film. 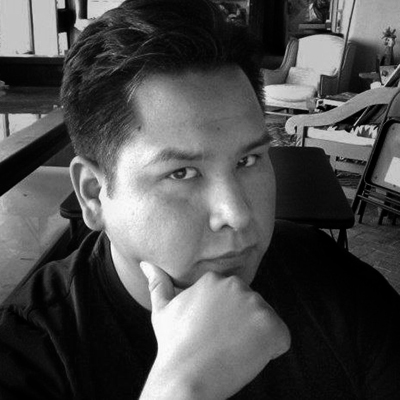 Over a decade later he is an acclaimed painter and graduate of the Institute of American Indian Arts. He lives and works in Rapid City alongside his wife Molina Parker, an award-winning Lakota bead artist. In 2015 Bryan was honored with the Br. CM Simon, S.J. 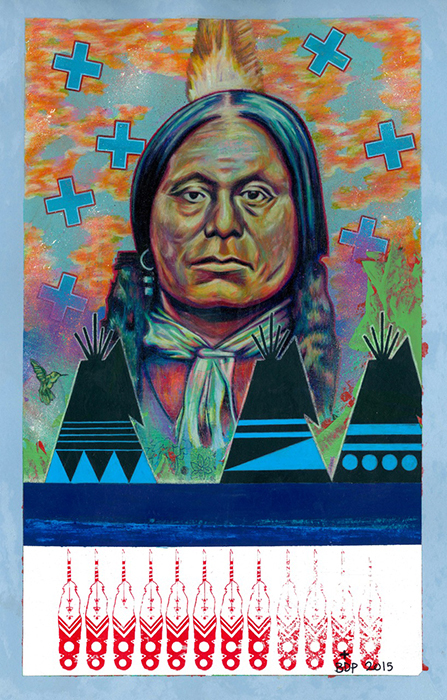 Award for his painting Tatanka’s Dream, which is featured on the 2016 Red Cloud Indian Art Show poster. We spoke with Bryan about his path to becoming an artist and what the future holds. Congratulations on winning the Simon Award! It is a wonderful painting. What was your inspiration for this piece? For many artists, we often paint what we know. We take something from the environment we’re in to inspire us. Being in South Dakota, there are many buffalo across the state. 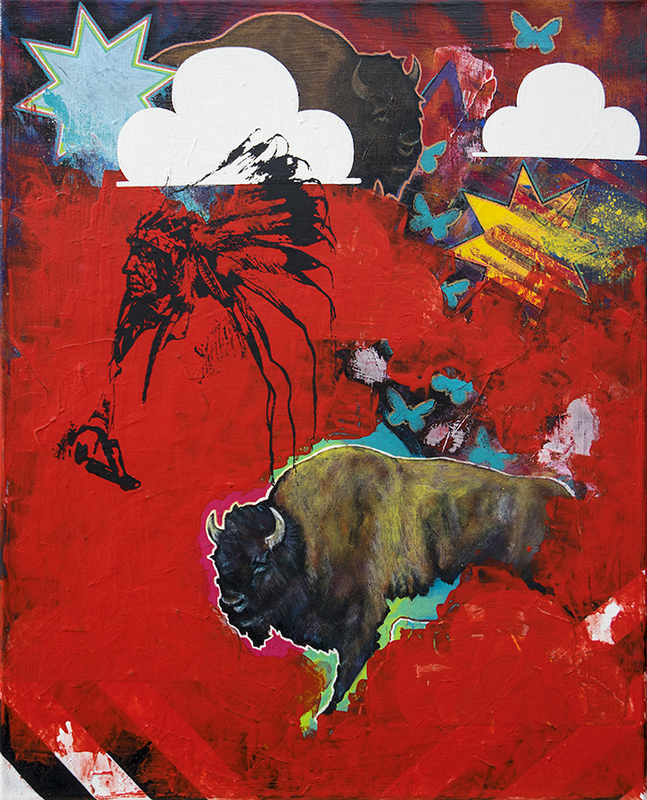 And there’s a deeper significance because my wife is Lakota and the buffalo is a big part of her culture. It provided her people with life—through tools, clothing, and food—literally and spiritually. It’s a symbol of both the land and the people, so I used that as my primary inspiration. With my work, I like to identify one subject and really focus on that in detail. The rest is improvised along the way. I don’t really set out and plan the whole composition. A painting can change, just like a story can change as you’re writing it. You don’t always have to stick to a script. The piece evolves and becomes what it’s going to be. With this piece, I’d started on it far before the deadline and thought it was finished, so I set it aside. But two weeks before the deadline, I picked it up again and my perspective had changed; something felt unfinished. I decided to add all the red that you see in the painting. I actually covered up a lot of what was already on the canvas and it became a whole different painting. To me, I felt I wanted something more solid in the piece and the red provided that. It was a last minute decision but I was happy with it. And of course I was so excited to win the Simon Award. 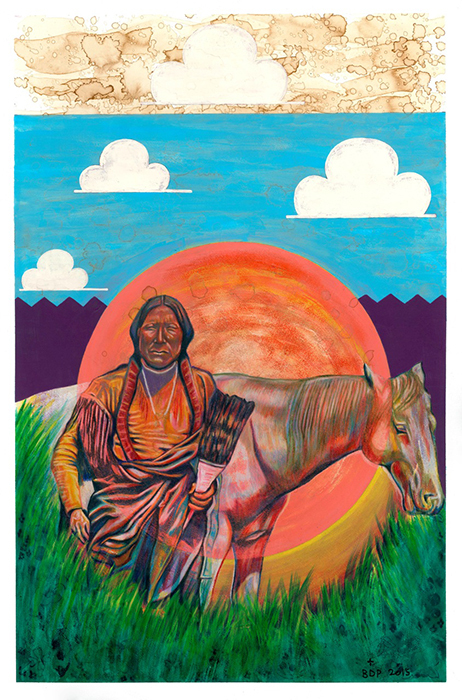 The Red Cloud show is such a great one to be a part of and The Heritage Center is really amazing about promoting emerging artists, giving them a chance, and inspiring and motivating them to pursue their art. 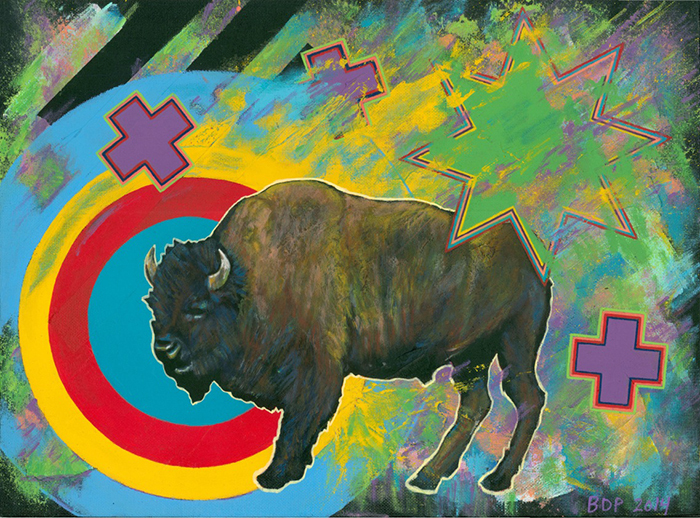 Talk about what it means to be a Native artist. Does your heritage inspire your work? I am White Mountain Apache, but I was adopted, and my parents are Muscogee Creek and Mississippi Choctaw. I honestly don’t know a lot about White Mountain Apache culture, but it’s one of my life’s goals to learn more. I want to know more about who I am as a Native American and let that steer my journey as an artist. Like many Native artists and Native people I grew up fascinated by the iconic, historic leaders, like Sitting Bull, Geronimo, and Red Cloud. They are like our Native superheroes and I’ve definitely focused on them in my work. Drawing them, and repeating those images again and again, has been a kind of self-taught art education for me. 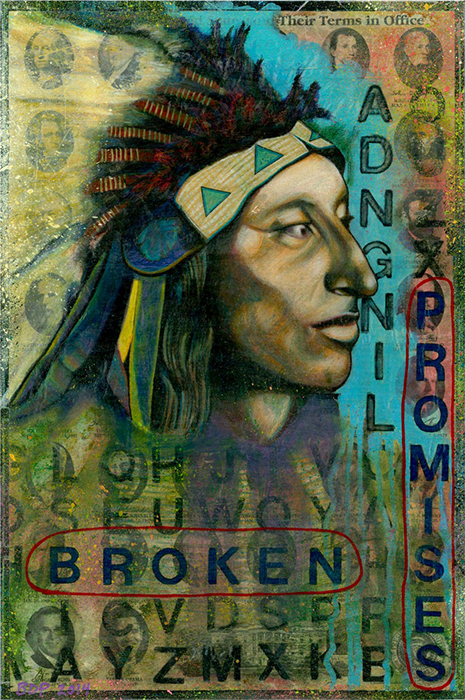 I’ve worried a lot about being offensive since I’m not Lakota myself or tribally affiliated with most of the other historical figures I paint. I don’t want to take something that is sacred to one nation and misrepresent it. So I tried very hard to respect those images and treat them with care—and I hope I’ve inspired people to learn about that time in history. But now I’m in a place where I’m wondering what my next body of work will be. Although I admire those iconic Native figures I need to figure out what’s really inside of me and to be inspired by my own history and identity. What has path as an artist looked like? As a kid, in elementary, middle, and high school, I always drew pictures. My parents and sister encouraged me, but I didn’t believe I was talented and didn’t think it was possible for someone to survive on their art. So I put it aside after graduating from high school, worked some odd jobs, and then decided I needed some more structure and enlisted in the Army. I spent three and a half years in the Army, and 14 months of that was in Baghdad and Fallujah, Iraq. I had always been fascinated by movies and film and during my time in Iraq I really felt I needed to document that time, including the people around me and what was happening on the ground. I came back to the U.S. for a family emergency—which I didn’t know was possible given the fact I was in the middle of a deployment—and I bought a video camera to take back [to Iraq] with me. During the rest of my time in Iraq I shot videos and took photographs and that inspired me. I knew I wanted to pursue cinematic arts. When I got home, my dad and I took a road trip to look at colleges. We went all the way to California to look at some big film schools, but on the way back we stopped in Santa Fe, New Mexico to look at the Institute for American Indian Arts. It wasn’t my first choice, but I applied and was accepted and it ended up being the best place for me. It was a really exciting place to be. Santa Fe has an incredibly creative energy and the school was really welcoming and nurturing—something I needed right after being deployed in a combat zone. My first year I took general studio arts classes and got back in touch with that part of me while I waited for the Institute to launch their film degree program. I focused on film for the next four years and my last year I met my wife, which led me here to Rapid City. How did you get back to drawing, painting, and two-dimensional art? During my last year of college, my wife stumbled across one of my old sketchbooks and she started encouraging me to pursue drawing and painting again. I wasn’t convinced but I did start to paint more and ended up selling my first painting at one of the Institute’s holiday bazaars. It was a small piece and I sold it for $40, but I was so happy. That experience gave me motivation—as did the encouragement of my wife, my family and friends. I kept painting and my work has progressed, although I’m always learning. I’ve continued to stay in touch with my peers from art school and learn from them about new mediums and techniques. Some have already pursued and completed their Master’s degrees and have experimented with new methods. They’ve all had setbacks and failures, but have risen through those clouds. They inspire me to stick with it—and expressing myself in this way really does make me happy. What are your hopes for the future—what will be your next steps in your journey as an artist? There are good things and bad things about being an artist. One of the good things is that you get to express yourself every day; to create something with your hands. But the bad thing is that you’ve got so many projects you want to do and not enough time. I very much want to continue to grow and develop my skills as a 2D artist. But I would also love to get back into film, to create short films and start working in the independent film industry and television. It would be a dream to work as set decorator or props specialist, just to be a part of the creative process of filmmaking. I’m also working to adapt scripts that I wrote during school and turn them into a graphic novel of short stories. 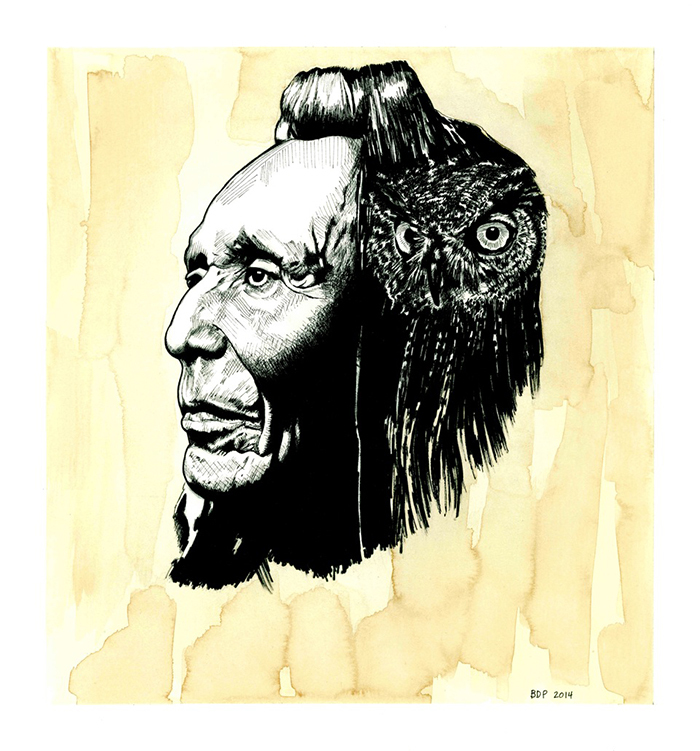 I’ve reached out to native artists whose illustrations I really admire. I wouldn’t trust myself to illustrate them on my own because I’m too involved with the stories personally. I want to collaborate with other artists because I think it would be amazing to let them interpret these stories in their own ways. What advice would you give a young artist today—someone just about to embark on his or her own journey? I would say that repetition is key—just keep doing it and doing it. Even if you’re drawing the same subject, keep doing it. Something will unlock that will fuel your desire to learn more about your chosen craft. There have been plenty of times when I’ve wanted to give up, but I was able to keep working. You learn from both successes and failures and you apply that knowledge to your next piece. Also, don’t be afraid to network with other artists, no matter how intimidating they might seem. You’ll be surprised how generous people can be and how often they’ll share their advice. Finally, don’t be afraid to make mistakes and mark on the canvas—get in there and just mess it up, because you can always paint over it or erase. When I was younger I was so afraid to draw or paint because I thought I would make a mistake. But many times, you’ll find a happy accident. Stay true to your own vision and only do it if it is fun.